New to the 18th Edition Wiring Regulations is the recommendation of AFDD’s. We have put together a complete guide to help you better understand what an AFDD is, why and if you need one, how they work and the different types available for domestic dwellings. What is an AFDD and what does it do? An AFDD is an Arc Fault Detection Device and it is designed to detect the presence of dangerous electrical arcs and disconnect the circuit affected. Why would I need an AFDD? Basic protection is provided by the cover of the consumer unit and the busbar cover inside, these prevent you from coming into contact with the live parts inside. You also have two RCD’s, these are each protecting a bank of circuits, they are there to provide additional protection in the event of a line to earth fault. However due to the way an RCD works it takes a lot less current to cause it to operate as opposed to a circuit breaker. So in the event of a line to earth fault they will generally operate first. As you can see you’re fairly well protected: you can plug too many things into a socket and the circuit breaker will trip before your cable burns out (then sets fire to your house), you can flood your bathroom and fill your lights up with water and your circuit breaker will trip preventing you from coming into contact with electricity, you can drill a hole in your wall straight through a cable and the RCD will trip before the circuit breaker even gets a look in, again protecting you from getting an electric shock. So what’s any of this got to do with AFDD’s? Well there’s one type of fault that none of the above measures will protect against; electrical arcing within a cable or connection. An electrical arc is created when the electrical current jumps the gap between two conductive materials and if the current is comparatively low, a spark will be produced. If however the current is high enough a continuous electrical arc is generated where the air changes from a gas to a plasma capable of supporting the arc. The temperatures created by this arc can exceed 6000°C. Now this is not to say that all arcing is inherently bad, lots of everyday pieces of electrical equipment produce an arc during their normal operation. For example when you flick a light switch on, a small electrical arc is created between contacts, likewise an electric drill will have arcing occurring inside its motor. So why is arcing a problem? Put simply, an Arc fault can lead to fire. An arc fault is where there is unintentional arcing in a circuit, as we’ve already mentioned the temperatures that can be generated by the arc can exceed 6000°C. This can create burning material at the point of the arc, which can then spread to the surroundings and ultimately into the dwelling. Where could an arc fault happen? The two most common areas for an arc fault to occur are firstly at cable terminations, where the termination is loose, and secondly within the cable itself where the insulation has been damaged picture. Why would my cable be damaged and why would there be loose terminations? The root causes for cable damage are extremely varied, some of the more common causes of damage are: rodent damage, cables being crushed or trapped and poorly handled and damage to the insulation of the cable caused by nails or screws and drills. Loose connections, as previously stated, occur most commonly in screwed terminations, there are two main reasons for this; the first is incorrect tightening of the connection in the first place, with the best will in the world human beings are human beings and make mistakes. Whilst the introduction of torque screwdrivers into the electrical installation world has improved this considerably mistakes can still happen. The second way loose terminations can occur is because of the electro motive force generated by the flow of electricity through conductors. This force over time will gradually cause connections to loosen. But surely if everything has been installed correctly and I’ve never mishandled any equipment I won’t develop an arc fault? That is very true, but let’s looks at some statistics for the minute. In 2016/17 there were 30,322 fires in domestic premises in England alone, of these 17,743 had an electrical source of ignition. Faulty or misused appliances, cables and equipment made up 10,982 of these. Whilst AFDD’s will by no means stop all of these occurrences they will act as another preventative measure to stop a potential source of fire. AFDD’s are an electronic piece of equipment; they continuously monitor the wave form of the current flowing through a circuit or circuits. On detecting an abnormal signature, such as that created by an arc fault within the wave form, they operate disconnecting the circuit or circuits. As we’ve previously spoken about, there are arcs that occur during the normal operating of an electrical installation, the AFDD’s are designed and tested in such a way that it will recognise a ‘normal’ arc, such as that within the electric motor driving a vacuum cleaner and not respond. AFDD’s wont detect a line to earth fault like an RCD or circuit breaker will, they won’t detect a line to neutral fault the way a circuit breaker will and they won’t detect an over load current the way a circuit breaker will. AFDD’s have another blind spot – Ring circuits. A ring circuit, is, as the name suggests a circuit that forms a ring, starting and finishing at the consumer unit, they are commonly used in the U.K. The chances are all the sockets in your property are part of a ring circuit. The problem with ring circuits is as follows; you won’t know that the ring has a break in it. If the electricity tries to flow round the cable and comes to the break it won’t try and jump it and create an arc, it will take the long way round the rest of the ring. You’re not aware there’s a problem as all your sockets still work, the AFDD’s not aware there’s a problem as there’s no arc. Please note though this will only apply to a series arc fault in a ring circuit not a parallel arc fault. What is a Parallel arc? A parallel arc fault is where the arc occurs between the line conductor and either the neutral or earth conductors. If an arc fault occurs between line and earth there is quite a high likelihood that the RCD will also operate. What is a Series arc? A series arc fault is where the arc happens between two parts of the same conductor, such as a broken line conductor or a poorly terminated line conductor in the terminal of an accessory such as a socket. Do I need to have AFDD’s fitted? As to whether you should have them fitted in your property, your best option is to speak to a registered electrician. Bear in mind however that they are very new to the domestic market and that it may take a little while for the electrical industry to get up to speed. Will my electrical installation be safe to use without AFDD’s? If your installation is covered by a either a current EIC (Electrical Installation Certificate) for new installations (generally will last up to ten years from date of install for owner occupied premises) or a current EICR (Electrical Installation Condition Report) for existing installations (the time period that this will cover will vary depending on the outcomes of the report), then barring damage occurring after the issue of the relevant certificate, your installation should be safe for continued use. During the completion of either of these two certificates, testing will have been performed that would highlight the issues likely to give rise to an arc fault. However, as we have noted, damage could have occurred subsequently to these tests. If you have any concerns regarding your electrical installation, the best advice we can give is to contact a registered electrician. If you have neither an EIC nor EICR for your electrical installation, it is recommended you should have an EICR done as soon as possible. Smell of burning coming from cables or socket outlets. Whilst there could be other causes other than an arc fault, the smell of burning coming from either cables or a piece of electrical equipment is not a good sign, similarly if the cable or equipment feels hot to the touch, turn off the circuit affected. If its fixed cabling or appliances contact a registered electrician and ask them to investigate. Scorch or burn marks on items of electrical equipment. Similar to the above, arcing may not be the primary cause of the scorch or burn marks, but again the affected circuit should be isolated and a registered electrician contacted. A rapid or intermittent ‘clicking’ noise accompanied by a burning smell coming from inside your consumer unit. If you encounter this situation, turn off the circuit affected and, contact a registered electrician. Remember you should always have fire alarms fitted in your property (see our guide to fire alarms for more advice). What types of AFDD’s are available? How much do AFDD’s cost? At the moment, the cost can be seen by many as off putting when compared to other protective devices installed in consumer units. In all likelihood this will change over the coming years, as the demand for AFDD’s increases. As AFDD’s are so new to the UK domestic electrical market it is very difficult to obtain a broad range of prices. The cost is currently sitting between £70 to £200 per AFDD depending on its type and rating. CPC or Circuit Protective Conductor – The earth conductor that is within a typical single phase installation. In older installations this may be a bare copper conductor or it can be covered in a green sleeving. In a new installation the copper conductor will be covered in green and yellow sleeving. Arc – An electrical charge that breaks a non conductive medium (typically air) into a plasma capable of conducting the flow of electricity. The resultant visible discharge tends towards an arc shape due to heat convection effects. Consumer Unit – Also known as a fuse board, CU or fuse-box. This acts as a distribution point for the circuits within your property. It is also where the majority of the protective devices are found. EIC – Electrical Installation Certificate. The document that should be issued on the installation of a new electrical installation. This will contain the details of the person responsible for designing, installing and testing the work. EICR – Electrical Installation Condition Report. A document that is used to describe the condition of an existing installation. Ring Final Circuit – More commonly known as a ring circuit or a ring main. A circuit most often used for supplying power to socket outlets. 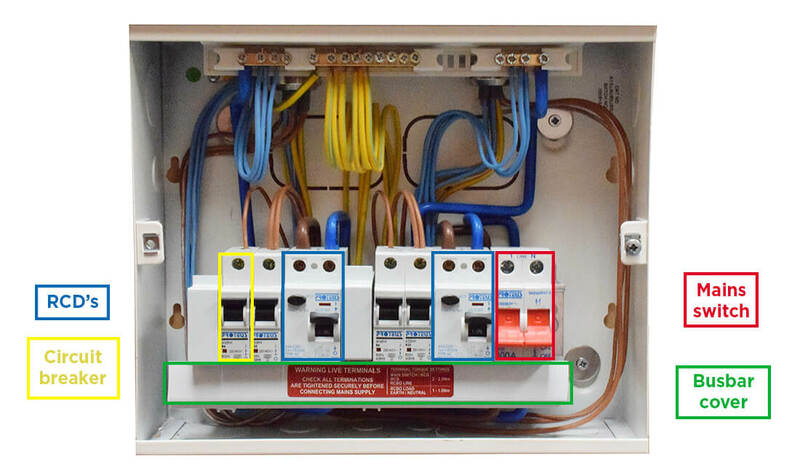 The easiest way to think of a ring circuit is that it starts at the consumer unit and ends at the consumer unit as opposed to a radial circuit.